Hello everyone!! Happy Sunday, to embrace the joy of sundays i felt like wearing ''Big Brights'' colors. I don't know about you, but i've been loving circle skirts lately there's something very feminine about them which i really love. My outfit of the day is from www.sammydress.com and i can tell you that my experience with them so far has been great, i adore the pieces i got from them, the neon top is just gorgeous you can mix it with a whole lot of things and the skirt is just lovely, quality is pretty good as well. I would be definitely getting more stuff in the future, i'll be probably making a wish-list showing you the beauties they have. Hola a todos!! Feliz Domingo, para enfatizar la alegría característica de los domingos, me vestí con colores brillantes. No se ustedes pero yo he estado amando la tendencia de las ''Circle Skirts'' últimamente y definitivamente hay algo muy femenino en ellas que me encanta. El outfit del día de hoy es de www.sammydress.com y les puedo decir que mi experiencia con ellos hasta ahora ha sido muy buena, adoro las piezas que he obtenido de ellos, el top neon es bellísimo y es muy versátil a la hora de combinarlo con otras prendas y la falda es sencillamente hermosa, la calidad es muy buena por igual. Yo sin lugar a dudas volvería a ordenar mas cosas, probablemente haga un wish-list enseñándoles las bellezas que tienen. lovely outfit, that skirt is such a fun print. That skirt is beautiful!! I love it! 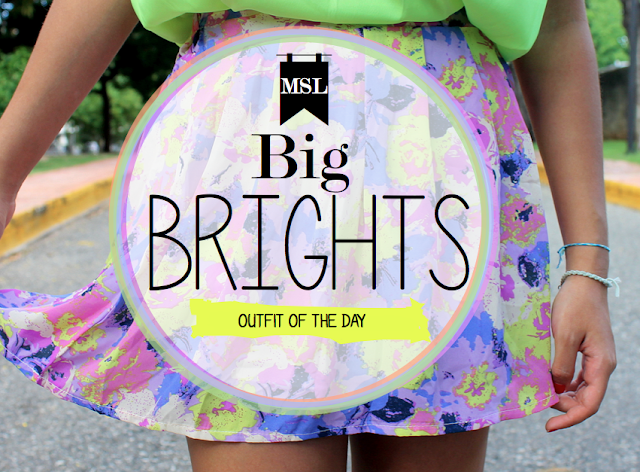 You look great, love wearing brights no matter what time of year, it can make you feel happier haha. What a beautiful and fun outfit! That skirt is so pretty! I agree - there's just something so pretty and feminine about a circle skirt. Especially one in a fun color and print. Me gusta el estampado de la falda!!! Wauw... wat een leuke outfit! I love your outfit, prints and colors are gorgeous! Beautiful outfit! Nice blog and taste you have! Me ha encantado tu blog, qué te parece si nos seguimos? That is such a lovely top! I love the color and cut of your top! Amazing! genial look, un look muy colorido!! Las fotos muy bonitas !!! Precioso look!! Me encantan los colores flúor! ugh i just love your shirt so much the colour is freaking awesome!!!! Love that print, reminds me of Warhol. ahhh I love bright colors u look awesome! I miss Summer! Your clothes are really pretty! !